There are awesome competitions and then there are awesome competitions. This is the latter, if you get our meaning. We've teamed up with Corsair to give you the chance of winning one of five 240GB Neutron GTX Series SSDs! That's over a grand's worth of high-performance solid-state goodness just waiting to be won. 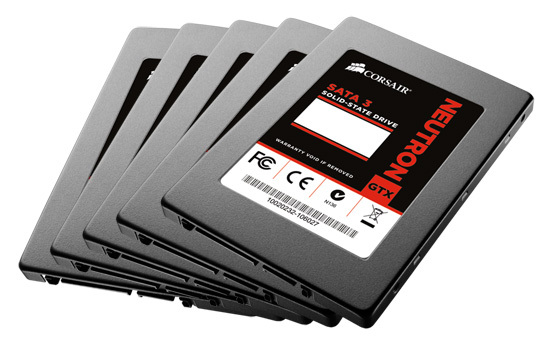 Introduced as the industry's first consumer SSD powered by the LM87800 SATA 6Gbps controller from Link_A_Media Devices, the Neutron GTX promises blistering read speeds of up to 555MB/s and is capable of carrying out a dizzying 90,000 input/output operations per second. Five amazing prizes for five lucky winners. Sound good? Then answer the question below or enter via our dedicated Facebook competition page. And don't forget - you can enter using both methods to get a free second entry and increase your chances of winning! Now this is a nice compo! (well they're all great). My thanks to Hexus & Corsair for this! Yet another excellent competition from Hexus!